22 Michaels: ebay store for Shoes of Prey? I had our earlier post about how we use our sample and returned shoes in the back of my mind when Janet Leach of Artery Store tweeted that she had set up an ebay store and that it was working quite well for her. We'll list our sample and returned shoes on ebay for our normal price but offer free shipping. We don't want to move into discounting and don't want to create a situation where our customers can return shoes because they are the wrong size, then watch as other people buy their design at a cheaper price than they can buy the shoes for. The goals of the store will obviously be to sell the sample and returned shoes, but also to introduce ebay users to Shoes of Prey and drive traffic back to our website so they can use our online shoe designer to design their own shoes. Have you set up an ebay store before and if so any tips for us? Any other sites you think we could set up stores on that would allow us to sell our sample and returned shoes and drive traffic to the Shoes of Prey website? Photo Credit. I've created an ebay account and created our first listing. To open an ebay store you need a feedback score of 5 which I think means we'll need to sell 5 shoes with standard listings first. Our listing has been up for nearly 24 hours and unfortunately has only had 3 views, all of which have been me, so I'm not sure how we're going to go! Any tips are most welcome! Seriously don 't worry about damaging your brand just be clear on what is for sale and what must be bought direct rather than via ebay. Could be a good brand building exercise to drive awareness. it'a alla bout how it is positioned. Yes, eBay has the image of being a bargain hunter's paradise. And, to a large extent that is true...!! But, you can still sell "premium" products successfully on eBay. I can say this with personal experience selling on eBay over the past 8 years competing against cheaper priced goods from China / Hong Kong. I agree with Steve. Use eBay as a marketing channel. 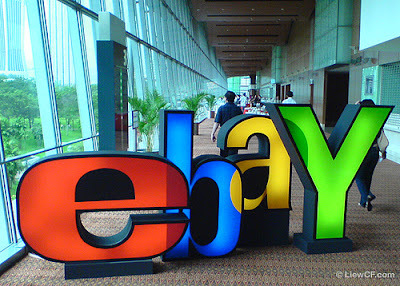 Leverage on eBay's massive traffic domestically and internationally...!! Based on my traffic stats, most the traffic coming to your listings will come from Search Engine searches. Guess who it is...... No, not Google...! The traffic will come from the internal search function in eBay AU + International websites...!! So, those "bargain hunters" that eBay attracts may well just stumble onto your listings whilst searching for "designer shoes", etc etc. Make your eBay listing presentable and professionable. DO NOT use the sub-standard templates that come in-built. And, per the above, use keywords that will attract your target audience. It doesn't hurt to have multiple marketing channels if you keep the branding & image consistent. On a personal note (blog post in progress), I think that Etsy is actually BAD for the handmade world. Put the world's talented designers & artists in one place and what happens...? The cross-fertilisation of ideas? New innovation? A community spirit? Yes! Yes! Yes! Have a look and you'll see how ridiculously cheap it is to get things handmade...!! Steve, Matt and Daniel, great thoughts, thanks! I'm going to set up the eBay store today, Daniel thanks for the tips on ensuring I include appropriate keywords and to not use the standard templates. I'll look into Etsy too, cheers for that suggestion. yeah, I personally find ebay a bit hit and miss and my perception is that it is a bargain paradise, so might distract a little from your current branding. Obviously there are ways of controlling quantity and stuff through e-bay, but how are you going to get a compelling msg to them when "all" they save is shipping. I agree that you dont want to deep discount, but surely an incentive is required. There is also the risk of confusion. Your brand and image is about personalised, and yet these are premade for someone else, and you'd need to cover the potential 'stigma' of selling me second hand shoes. Again, this is perception rather than fact. I'll write more when I have some +ve ideas!! Thanks for your thoughts Dom. Our eBay listing is at 45 views which isn't many at all, and it doesn't look like any of these viewers have gone on to visit the Shoes of Prey website. Not sure how well eBay is going to turn out for us but I'll do some more experimenting.